As we get closer to Christmas, the amount of time left to order personalized gifts online is growing shorter and shorter. Things Remembered ships all personalized items within 3 business days. That is remarkable compared to many other sites, which have a disclaimer that it could take up to 2 to 3 weeks to ship your personalized gifts. If you are a last minute shopper, you can also visit your local Things Remembered store location to place your order. Things Remembered offers personalized gift ideas for pretty much everyone on your list. They offer 30 different gifts for boys alone. 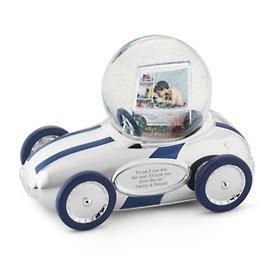 This Race Car Water Globe was a perfect choice for our kindergartner who is obsessed with cars. 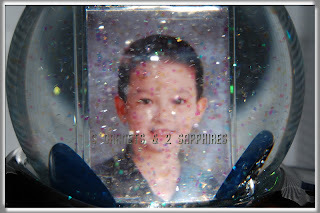 You can insert 2 photos back-to-back inside the water globe filled with glitter. I chose to use the same school portrait on both sides, but it would be nice to use a baby picture on one side and then a current photo on the other. I think this race car will surely be a cherished keepsake for my son. 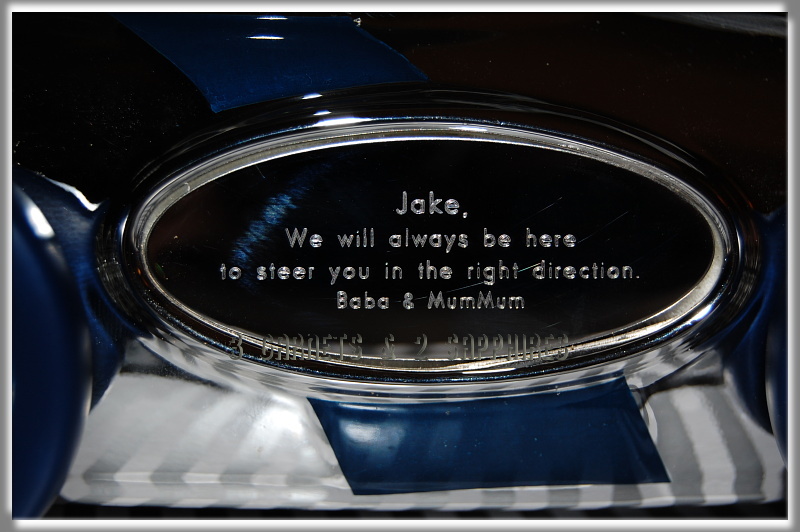 We had the personalization plate engraved with a special message for him. 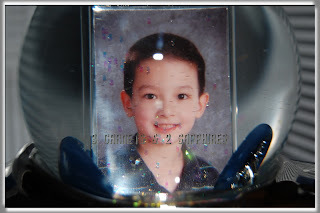 I can see him still proudly displaying this water globe on his desk 20 years from now. One feature that I will expect to especially appeal to my son is that this race car has working tires. I also want to point out that changing the photo is extremely easy. 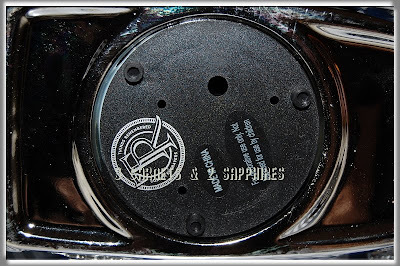 You need only to turn and remove the cover on the bottom and then remove the piece which holds the photos. Here are additional gift ideas for the rest of the family . . . The Things Remembered Custom Couture Jewelry includes both necklaces and bracelets. It is so easy to customize your jewelry. Simply select one of four different types of chains, of which one is a strand of pearls. 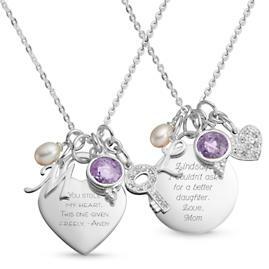 Then just select an engravable pendant and a mini charm to top it off. Personalized jewelry would make a great gift for a mother, grandmother, a daughter, a favorite aunt, or a best friend. 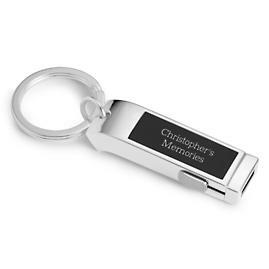 A personal, but practical gift idea for a father, big brother, or best man would be this 1GB silver-plated Memory Stick Keychain. It can be personalized with a name on the front and a special message on the back. Every time the recipient plugs this flash drive into his computer, he will think of you. 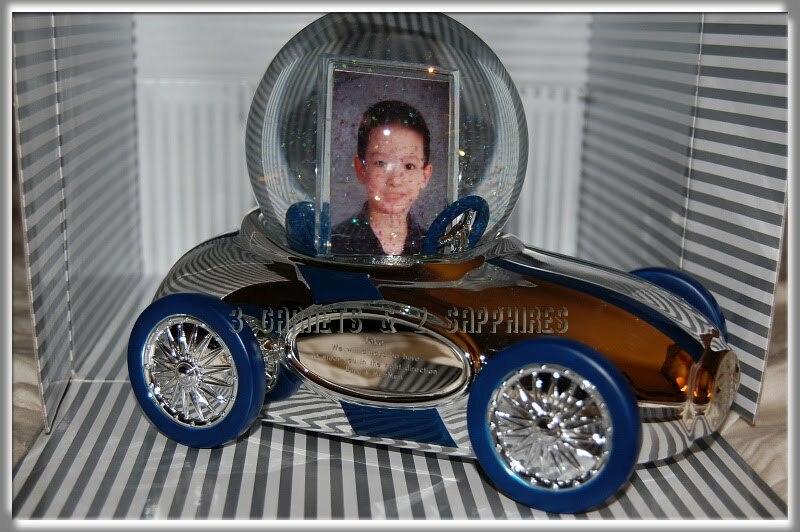 Here is one of several gifts in the Things Remembered Make-A-Wish line. For every product sold from this special line of gifts, $2 will be donated to the Make-A-Wish Foundation. This teddy bear water globe features Max Teddy Bear, who is both soft and posable. Plus the water globe can be personalized with a name and short message. This gift would be perfect for any member of the family and can be displayed all year round. Here is another charming gift that would be suitable for almost anyone. It is a motorized rotating musical Snowman Water Globe. The song it plays is White Christmas and the snow blows without your having to shake the snowman. This nearly 8" snowman will surely put a smile on your loved one's face. Visit your local Things Remembered store or browse ThingsRemembered.com for additional holiday gift ideas. Thank you to Things Remembered for providing us with both a review product and a contest prize free of charge. One lucky reader will receive their choice of one of the gifts featured in this article . . .
Browse the many personalized gifts available on ThingsRemembered.com . Then leave a comment telling me what one item (other than the 5 featured here today) would you love to give as a gift this year AND who you would give it to. You MUST do this to be eligible to win this contest. 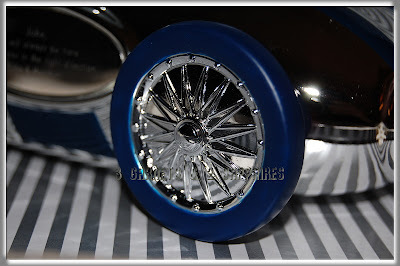 3) For 10 extra entries, blog about this contest linking back to this post AND Things Remembered. Then come back here and leave TEN separate comments with the link to your blog post. 4) Follow Things Remembered on Twitter. Then leave a separate comment with the link to your Twitter profile. This contest will be closed on Monday, December 14th, 2009 at 11:59pm EST. A random number drawing will be held shortly after. The winner will be announced here and will be contact via email or through their blog. If the winner does not respond within 48 hours, a new number will be drawn.